Mike Townsend's love of hills and wild places began when he spent teenage walking holidays in the Lake District and Snowdonia. Later, at Edinburgh University, his horizons expanded north to the Scottish Highlands, and in 1969 he first glimpsed the Isles of Uist and Barra from the Cuillin of Skye. His interest in mountaineering then took him further afield – to the Alps and Greenland. After graduating in Geology, he was self-employed as a freelance mineralogist through much of the 70s, and this occupation involved extensive travel and occasional mountaineering, principally in South America and Australasia. 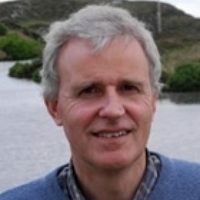 Mike moved to the Outer Hebrides in 1980 to work as a Geography teacher on Barra, and relocated to Uist in 1988 to teach on the Isle of Benbecula. He has spent many prolonged periods since then, and even more since his retirement in 2010, exploring the hills and coastlines of the islands, particularly the more remote and unfrequented areas.